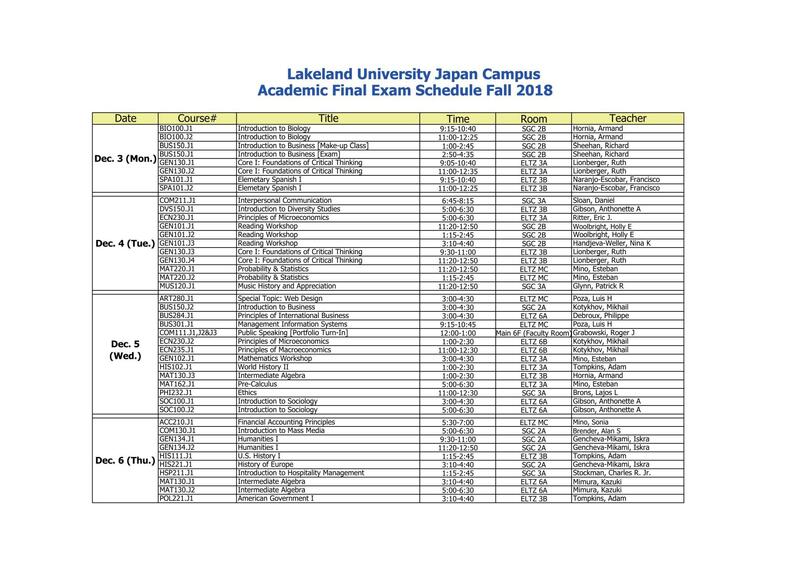 The Final Exam Schedule is published now, so please check your exam day with the image below or click here. Please ask your instructors of the detail of the exam and the exam day. Student Affairs offcie will close at 4:30 today (November 21). The Academic Affairs office will be temporarily closed today (Nov. 19th) only between 12:00 p.m. and 15:00 p.m. due to the orientation for new academic students. We are sorry for any inconvenience which may cause you. Student Affairs offcie will close at 4:30 today (November 12) and this Wednesday (November 14). We will close at 6:00 on other days. A make-up class will be held on Thursday, Novemeber 22nd at regular time in SGC 3A. Please note the classroom you will meet is not a regular classroom. Today's class will be cancelled and make up class schedule will be announced later. If you have any questions, please contact Ms. Handjeva-Weller. Today's class has been cancelled and make up class schedule will be announced later. Student Affairs offcie will close at 4:30 from November 5th (Mon.) through November 7th (Wed).